Forty-something and freshly engaged, I found myself alternately amazed and aghast at the wide, wild world of weddings in the new millennium. "Unity sand" is really a thing? Since we married in September of 2015, I'm now learning to navigate the life of a newlywed. FsFTB includes a little cultural commentary, a whole lot of love story, a few tips for DIY decor, and the occasional life lesson gleaned from love in the slow lane. New posts appear on Fridays or thereabouts. Enjoy! Down the aisle: Follow FsFTB! Last weekend, RoanokeWeddingNetwork.com held their annual Wedding Crawl. Each year five downtown venues, working with local wedding professionals, pull out all the stops to create mock weddings in each space, featuring ceremony and/or reception set-ups complete with food, flowers, photographers and photo booths, music, lighting, and models dressed as brides, grooms, and wedding party. It’s rare opportunity to see the spaces fully decked out and filled with people, as they would be during an actual celebration. And it always benefits a good cause: this year, the Roanoke Valley SPCA. Hubby Steve and I decided to revisit the Crawl this year. We’d attended the 2015 Crawl as then-prospective bride and groom and had so much fun: dancing in the Corinthian Ballroom, tasting cake at the Taubman. I even caught the bouquet in a prize-giveaway toss at Center in the Square. Even though we already had most of our vendors sewn up by then, the Crawl gave us a chance to see examples of their fully realized visions, which made us look forward to their creations for our own wedding day all the more. This time was not about looking forward, but looking back. At our first stop, Charter Hall, Steve and I picked up the most recent copy of bridebook, which features our wedding story. At the Taubman, our next venue, we lingered in the ethereal ceremony space (created by Lighting Ninja and Gloriosa) as an RSO harpist began to play. Steve smiled and took my hand: it was Pachelbel’s “Canon in D,” the music I’d walked in to at our ceremony. At the Patrick Henry Hotel Ballroom, our photographer Noah Magnifico had some of our photos in his display, and we admired the lush elegance of the bouquets and centerpieces crafted by Mark Frye of Creative Occasions, who’d done such a beautiful job with our flowers. We saved the Center in Square Rooftop, where we got married, for last. It was hopping. Creative Entertainment had fashioned a Vegas theme, complete with game tables, a bride who doubled as a mobile hors d’oeuvres table, showgirls, and Elvis. We picked up information on honeymoon travel–we still hope to take a romantic trip somewhere tropical–from Rose of the Winds Travels, and said hello to my stylist, the awesome Brandy Moorman of Bliss Studio. After tasting brunch menu samplings from Chanticleer Catering and delicious mini-cupcakes from For the Lsove of Sweets, we headed outside. The view from the roof, as always, was breathtaking. It was sunny, if a little windy, with the clear, bright blue skies I’d hoped for on our big day. We attempted a selfie in the same spot on the upper deck where Noah had taken our wedding pictures, but we couldn’t stop squinting—maybe those dramatic rolling clouds had been a blessing in disguise? We walked down the staircase to the spot where we’d said our “I do’s.” We held hands and shared a happy kiss. Operation Newlywed Nostalgia was complete. We missed the last featured venue, the White Room at Blue 5, where we’d been told a real wedding would take place as part of the crawl. Sadly, that meant we also missed the opportunity to taste delectations from our favorite baker, Evie’s Wildflour Wedding Cakes. Coconut cupcakes with dark chocolate ganache… mmmmm. The Wedding Crawl felt different this year, minus the anticipation of our own nuptials and all the excitement (and anxiety!) that comes with waiting and wondering. But we were more than satisfied. It was a lovely day filled with beautiful sights and bountiful treats, and we’d already celebrated the real wedding that mattered most: ours. 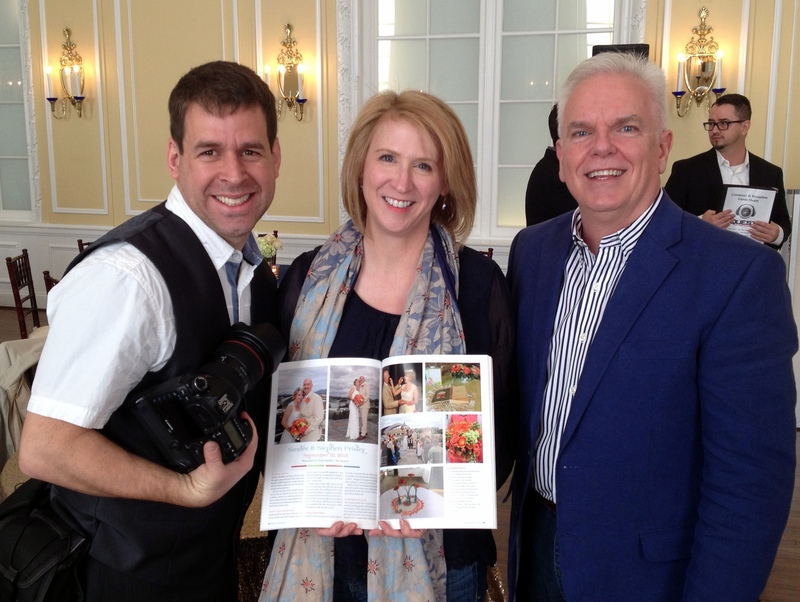 With two of our wonderful vendors, Noah Magnifico and Mark Frye, and our -bridebook- feature! Nothing else, a lack of chocolate ganache notwithstanding, will ever compare.